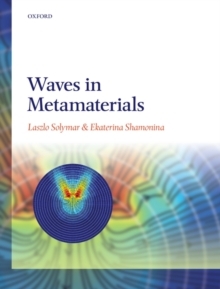 Metamaterials is a young subject born in the 21st century. It is concerned with artificial materials which can have electrical and magnetic properties difficult or impossible to find in nature. The building blocks in most cases are resonant elements much smaller than the wavelength of the electromagnetic wave. The book offers a comprehensive treatment of all aspects of research in this field at a level that should appeal to final year undergraduates in physics or inelectrical and electronic engineering. The mathematics is kept at a minimum; the aim is to explain the physics in simple terms and enumerate the major advances. It can be profitably read by graduate and post-graduate students in order to find out what has been done in the field outside theirspeciality, and by experts who may gain new insight about the inter-relationship of the physical phenomena involved.